Just in time for the weekend, California-based WiseCracker is ramping up production — and offerings — of its bike mounted bottle opener. 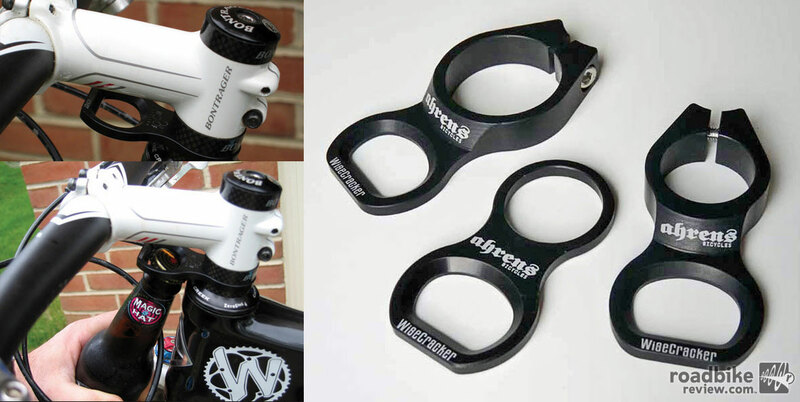 Ahrens has subsequently changed the primary mount location of the WiseCracker from the seat post to the headset — just below the handlebars, where it sits in view as a constant reminder of the frosty post-ride beverage that awaits. Besides the original alloy models, Wisecrackers are now available in stainless steel and titanium, and there is a wide range of colors and finishes, and even custom laser engraving options. WiseCrackers sell for $15-$28 in standard models, depending on the design and materials used. Check out wisecrackerltd.com for more info. Of course, if you prefer old fashion methods, MTB party boy Cedric Gracia has some tips for you. FFS. Thousands of dollars to drop a few grams off their bike, then add in 30 grams to open *beer bottles* on the trail?? DH and shuttling have already trampled all over the idea of mountain biking being about fitness and human power, why not piss on it too? Why not just start putting up signs on the trails “fat people with electric/motorized bicycles only”? If I find a guy who has bailed because of drunk riding, do I really have to stop and help him out of Darwin’s grasp?